Maryjane Fahey is a writer, designer, and former serial monogamist living in NYC. Her specialty has been journalism and editorial design, including the redesign of BusinessWeek and the Boston Globe, and the launch of Women’s Health. MJ is a graduate of the School of Visual Arts and Newark School of Fine Arts. Newark has an art school, that’s right — it’s not just where the airport is. 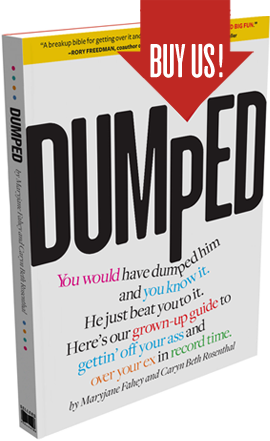 She has every intention of continuing her new career as a writer and absolutely no intention of being dumped again. Caryn Beth Rosenthal, a former Benny Hill Babe, is an actress/writer who hails from Jacksonville, Florida. Her credits include animation, sketch, soaps, and regional and Off-Broadway theater, including a solo show she wrote and performs in called Getting Over Mark, as well as numerous voice-overs and commercials. CB lives in NYC with her loyal mutt, Jax, an 8-pounder on wheels who thinks he’s a 200-pound four-legged rottweiler. His credits are too numerous to mention. 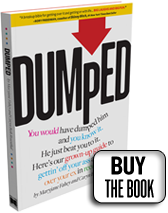 Sign up... We’re sure to be the best relationship you ever had! 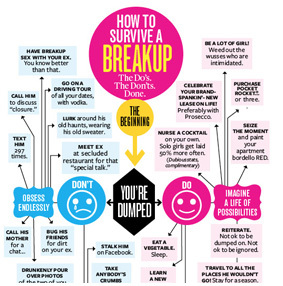 How to Survive a Breakup: The Do’s. The Don’ts. The Ultimate Info-graphic.